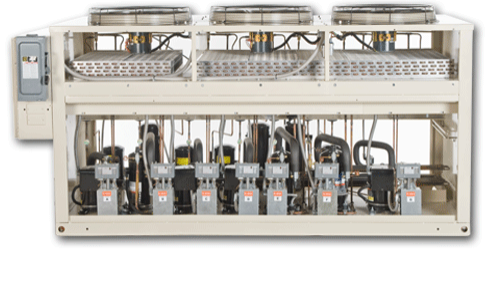 The remote air-cooled REFRIG-O-PAK refrigeration systems utilize safe CFC's for food service applications, cost less to buy and to install, yet can save up to 20% per month on energy usage. Ideal for all ambient conditions, the REFRIG-O-PAK can be located on the roof-top or next to the building on a concrete pad. The Cooltec REFRIG-O-PAK refrigeration systems are completely unitized with scroll compressors, single circuited coated condensers, oversized receivers, vibration eliminators, dual pressure controls, head pressure controls with crankcase heaters, prewired control panels with main fused disconnects, compressor breakers, contactors, relays and defrost time clocks. 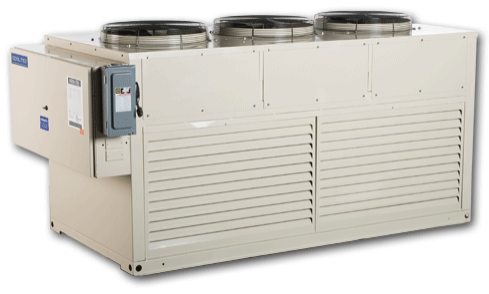 These systems are designed for vertical air discharge of hot air with an oversized condenser surface 50% larger than conventionally packaged refrigeration using single condensing units. With run times being much shorter, the service, maintenance, and electrical costs are greatly reduced. Completely pre-wired and pre-piped, requiring one roof penetration and single-point electrical connection, the REFRIG-O-PAK system will reduce up-front construction costs. The need for multiple electrical power lines for each compressor and electrical fused disconnects is eliminated. Cooltec offers eight standard models with as little as two compressors up to twenty compressors for all cooling applications and has continued a proven track record with hundreds of units in operation worldwide.